The region where the Coffee Cultural Landscape of Colombia (CCL) is located was inhabited by hunter-gatherer groups nearly 10,000 years ago. Around 500 BC its inhabitants practiced agriculture and near 100 AC they worked with gold using sophisticated techniques. People lived in small unit settlements and grew corn, beans and sweet potatoes (batatas). Bamboo (guadua) was the raw material used for construction. The arrival of the spanish conquerors (the Spaniards) in the 16th century led to the physical and cultural disappearance of most of groups that lived in the territory. While the warfare, diseases, and mistreatments quickly extinguished the population, the encomienda system, evangelization processes and village relocation disintegrated their organizations and transformed their culture. When Spaniards arrived they found a vast population with local differences in terms of customs and languages. 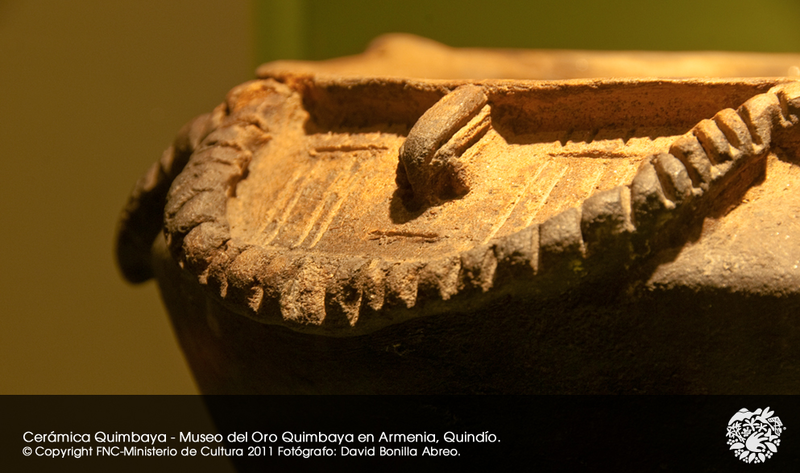 However, all archeological objects found in the region have been attributed to the Quimbaya culture, despite the fact many of them were produced by other groups at different periods of time. The pieces collected so far reflect an advanced management of metals, ceramics, and textiles. Sadly, precise timelines of all cultural groups and periods have not been able to be constructed because of the persistence of grave and archeological site robbing. The burial sites found in the region are pit like structures with lateral chambers and funerary ornamentation recovered in “lajas” (cancel tombs). 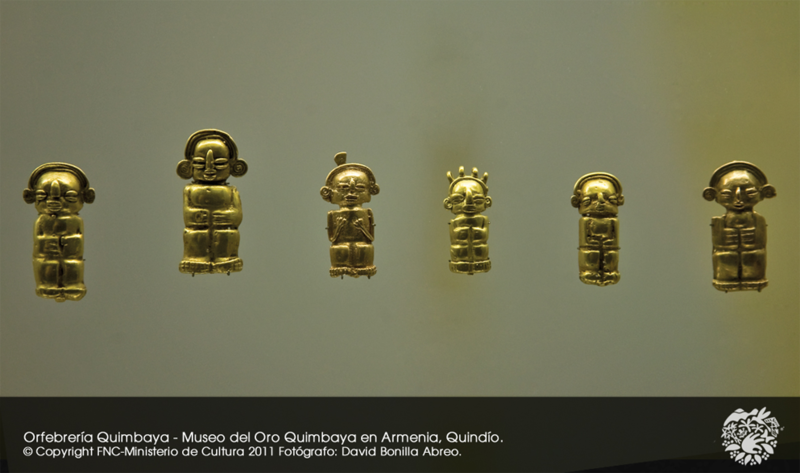 The goldsmiths of the Quimbaya period developed body ornaments, objects for the consumption of coca leaves, music instruments, and tools. Most of the pieces were made for the group´s leaders to use. Once the leaders died, the ornaments were buried with them. The color, smell, brightness, and sound of this coveted metal were religious and power symbols. Its use resulted in the depuration of casting, alloying, hammering, and polishing techniques.